Microsoft via Xbox Wire website has this week revealed more about the content and extra updates you can expect to enjoy during the spring and summer of 2016. 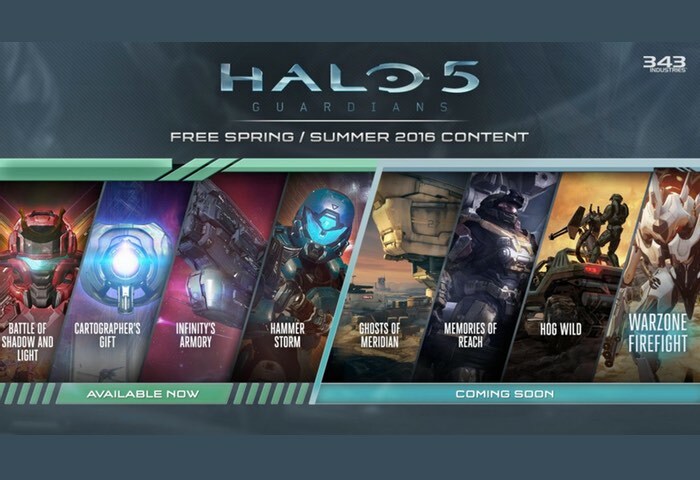 As Halo fans already probably already know Hammer Storm Halo 5 content is now already available more of which can be seen in the official launch trailer which is embedded below for the Halo 5 Guardians DLC. 343 Industries has taken to the official Xbox Wire website to explain more details about what you can expect in the coming months as well as explaining what you can expect from the latest Hammer Storm update. – New game modes: Grifball, Assault and Fiesta. From the hammer-meets-sword sports sensation of Grifball, and weapon-roulette hilarity of Fiesta, to the fan-favorite Assault game type that’s been fully evolved for Halo 5: Guardians, Hammer Storm brings a brand new game mode to fit every flavor of Halo fan. – New map Torque. An entirely new environment primed for battle, Torque is a large symmetrical map that caters to Capture the Flag and Assault game modes. The pistons in each courtyard can provide key gameplay for cover, traversal, and objective movement. – New weapons change the game. The Gravity Hammer provides the proper tool for smashing enemies, and the Halo: CE Pistol brings back a legacy of single handed death-dealing. Be sure to watch for the classic headshot death animation when you deliver the killing blow! – New REQ items. Hammer Storm contains a myriad of new REQs, including attachments for loadout weapons, weapon skins, armors, emblems, assassinations, visors, and stances. – New possibilities with Forge. The new “ball” mechanic that powers the Assault and Grifball modes unlocks the potential for entirely new game types in Forge mode, not to mention paving the way for returning favorites like Oddball and Ricochet. As many of you know, with Halo 5: Guardians we set out to continually transform the game, adding more content, maps, items, gameplay and overall Halo goodness long after launch. It’s easily the most extensive post-launch content plan for a Halo game ever, with free content releases like The Battle of Shadow and Light, The Cartographer’s Gift, Infinity’s Armory and, available today, Hammer Storm. For those keeping track, that’s 11 new maps, 12 new modes (including Big Team Battle and Forge) and more than 180 new REQ items – all completely free. For more information on the new Halo 5 content jump over to the Xbox Wire website for details via the link below.